McGill University today announces it will co-develop with Xebec Adsorption Inc. (TSXV: XBC) a prototype reactor to produce Renewable Natural Gas (RNG) using the Power-to-Gas (P2G) process which combines electricity generated by renewable sources and CO2 generated from waste. The project is being partially funded by a Collaborative Research and Development grant from the Natural Sciences and Engineering Research Council of Canada (NSERC). The value of the grant is $360,000 for a period of three years. Electricity generation from renewable energy sources (e.g., wind and solar) is increasing worldwide. In 2016, the installed wind power in Canada was ~12,000 MW (6% of the electricity demand), with Quebec and Ontario having the highest share1. However, wind energy is fluctuating and intermittent; therefore, energy storage becomes very important to not only bridge the temporal, but also the geographical gap between energy supply and demand. The P2G process offers a much larger storage capacity and discharge time than technologies currently in use, such as batteries and pumped hydro storage. 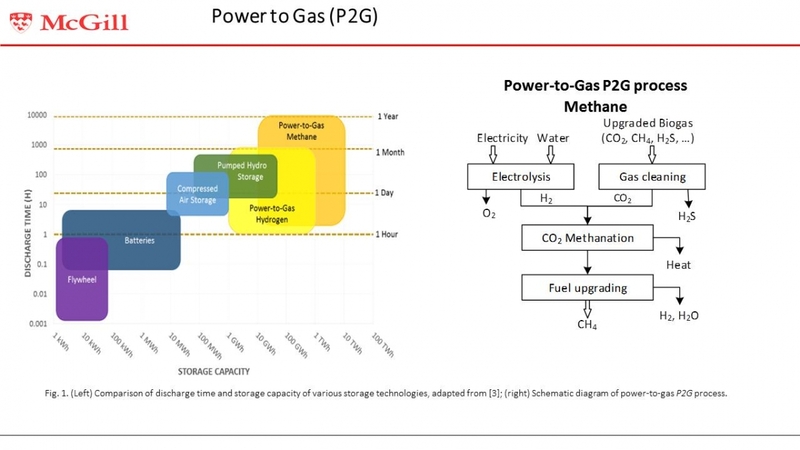 The P2G process uses renewable electricity to produce hydrogen via water electrolysis which is then further converted into RNG (i.e., methane) using the carbon dioxide captured from municipal waste. Thus, the already existing gas distribution infrastructure and mature end-use technology can be fully utilized to alleviate energy storage issues posed by renewable energy systems. The prototype reactor will have an output of 0.3 to 0.5 kW, with plans to scale up the project in a second phase. The Canadian Gas Association has set a target of 5% RNG-blended natural gas in the pipeline distribution system by 2025 and 10% by 2030 across Canada. Nationally, the increased RNG content would result in 14 megatonnes (MT) of greenhouse gas emission reductions per year by 2030, equivalent to removing 3 million passenger cars from the road. In Quebec, The Régie de l’energie has proposed a target of 1% RNG to be distributed by 2020 and 5% by 2025.